The Problem: It's still summer, and it can still be H-O-T out there.. And tropical levels of humidity demand something cool and refreshing. 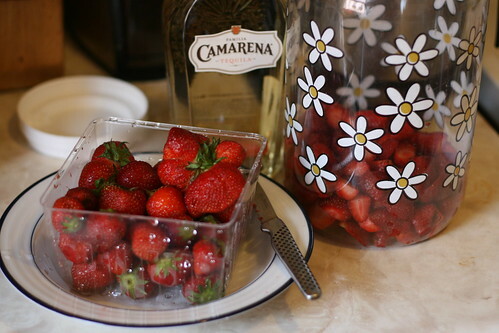 Maybe with bubbles and some lime, to cut the stickiness. In short, summertime demands a gin and tonic. And you want -- you deserve -- the best possible G&T, no? So how do you make sure you get the very best? We need to determine the best gin and the best tonic, obviously. Scientifically, by making lots of gin and tonics, changing slight variables, and seeing what's best. 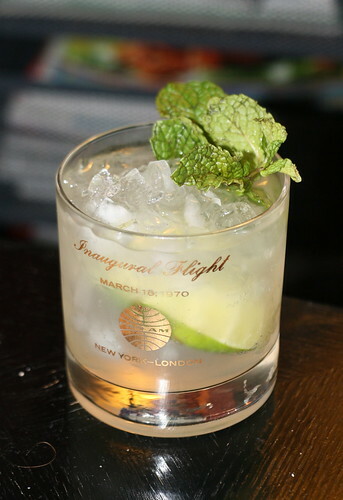 Fortunately, the fine folks at the Ultimate Cocktail Challenge were on the case, and last year they evaluated dozens of gins and determined the best one -- not just by itself, but the best gin for various cocktails such as a Negroni, Martini, or Aviation. (I stopped by the cocktail judging last year -- here's my report for Cocktailians.) The judges have spoken: the best gin in a Gin & Tonic is Beefeater 24. 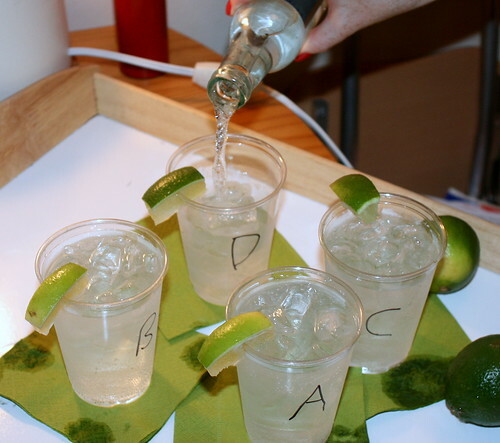 Thus, it's high time for a Tonic Water Shootout to determine which tonic is best. It should combine quinine bitterness with citrus brightness, and mesh perfectly with gin to produce a delightful drink. Which tonic would emerge victorious? The Judges: Much as in our evaluation of the cocktails of the Triple Crown, the judges consisted of Sam Meyer (yours truly), co-author Tony Hightower, and Special Guest Star Joanna Scutts, author of life.savour..
Fentimans Tonic Water: This soda company was founded in 1905 in England, but their products for the North American market are made at the Lion Brewery in Pennsylvania. The tonic water incorporates milled quinine bark, an organic grain base, and Asian lemongrass, and is sweetened with cane sugar. Fever-Tree Premium Indian Tonic Water: Named after a local African nickname for the cinchona tree, Fever-Tree was started by Charles Rolls, former marketing director of Plymouth Gin, and luxury food marketer Tim Warrillow in 2005. Their cinchona comes from the Rwanda/Congo border region, and they boast that they use eight botanicals including marigolds (!) from Africa, lemons and lemon oil from Sicily, and hand-pressed orange oil from Tanzania. 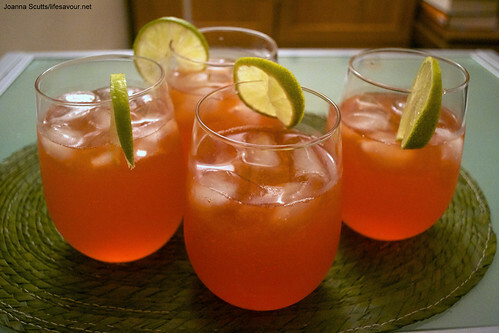 The tonic is sweetened with cane sugar. Fever-Tree Mediterranean Tonic Water: This brand-new offering from Fever-Tree claims to be the first tonic specifically formulated to pair with vodka. Its botanicals differ from the Indian Tonic Water, and include lemon thyme and rosemary from Provence, as well as citrus. 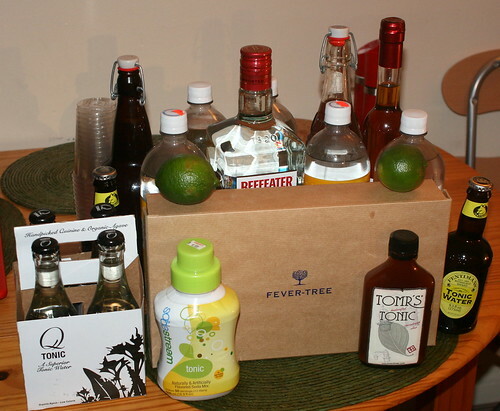 It can be fairly difficult to find and isn't even listed on the Fever-Tree website yet. Here we have the big two brands available at most supermarkets, as well as a store brand from a local grocery chain. 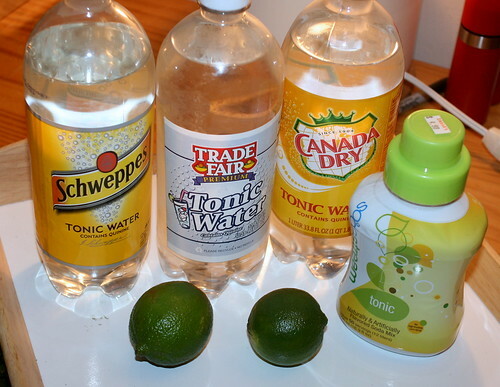 If you go out in search of tonic water, one of these types of products is probably what you'll find fastest and cheapest. All three are sweetened with high-fructose corn syrup and were packaged in one-liter plastic bottles, though small glass bottles of the big two brands are readily available as well. 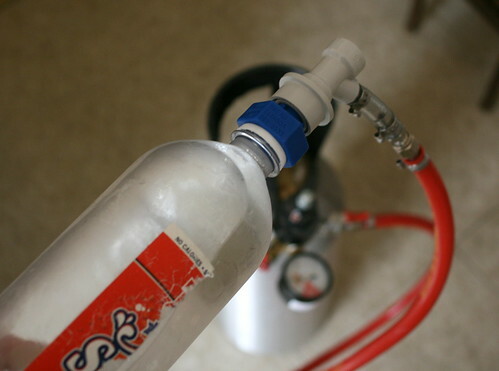 We also include a tonic concentrate designed to be mixed with carbonated water. Schweppes Tonic Water: One of the massive brands of beverage mixers, Schweppes was founded in Switzerland in 1783 and moved to London nine years later. After various corporate machinations, Schweppes is now owned by the Dr. Pepper Snapple Group, which is headquartered in Plano, Texas, and also produces many other brands including Rose's Lime Juice, IBC Root Beer, Stewart's Fountain Classics, Vernors, and, surprisingly, the other big mixer brand, Canada Dry. Canada Dry Tonic Water: Canada Dry was founded in Toronto in 1890, and launched its best-known product, ginger ale, in 1904. Canada Dry Tonic Water was introduced in the 1930s, when Prohibition demanded more mixers that could disguise the taste of bootleg and bathtub liquors. After similar corporate machinations, it was purchased in 1986 by Cadbury Schweppes and is now also owned by the Dr. Pepper Snapple Group. Trade Fair Premium Tonic Water: Store brand from a local grocery chain in western Queens, New York. This bottle was purchased right next to corporate HQ in Astoria, NY, a three-minute stroll from Cocktailians HQ. And according to the label, the product contains not cinchona, not quinine, but "QUINNNE." [Sic] transit gloria mundi! Sodastream Tonic Sodamix: From popular home carbonator manufacturer Sodastream, this concentrate is part of their line of soda concentrates, which extends to over 60 different flavors of sodas, teas, and naturally-flavored drinks. 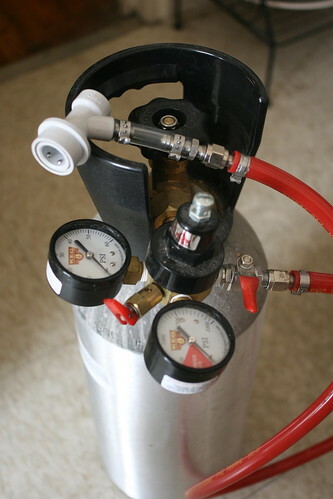 The company was founded in Israel in 1991, and has been operating in the US since 2003. Unusually, the tonic sodamix is sweetened with a combination of sucrose and sucralose (aka Splenda), not with high-fructose corn syrup. 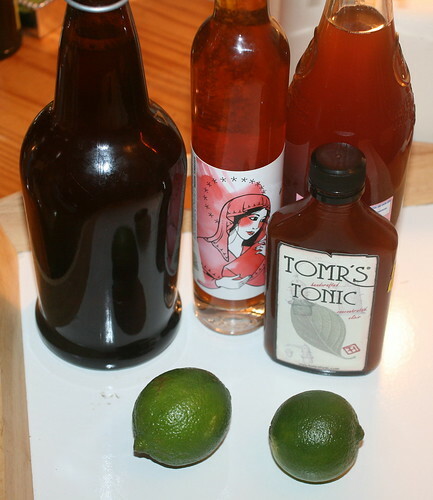 This group is everything else: two different recipes for homemade tonic syrup, one commercially available tonic syrup from a small company, and an alcoholic tonic liqueur. The tonic syrup market seems to have greatly expanded in the past year or two. I'd like to try more tonic syrups, such as the offerings from John's Tonic, Liber & Co., or Jack Rudy, but either wasn't able to track them down in fairly limited time or wasn't able to get to where they were sold. 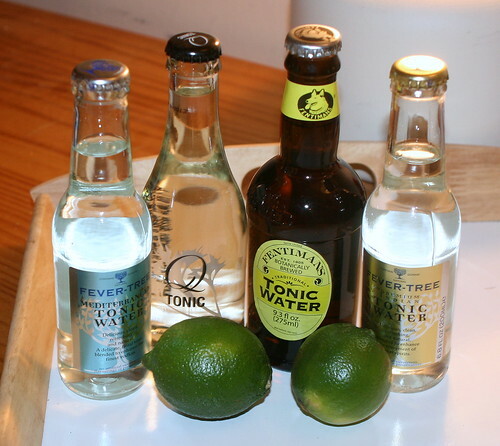 Nevertheless, these four tonics represent an artisanal approach to tonic water, usually coming from very small operations or sole proprietors determined to make better tonic. Toby Cecchini's Quinine Syrup recipe: Toby Cecchini owned Passerby in New York, claims to have invented the Cosmopolitan, and pens the "Case Study" column on drinking in T, the New York Times' Sunday magazine supplement. 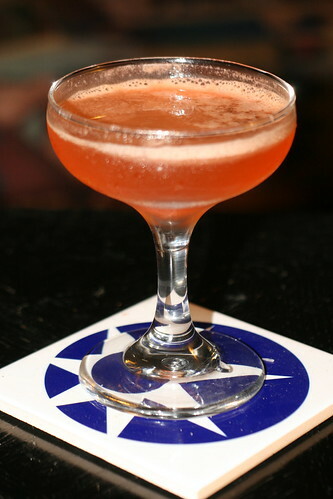 He notes that while his syrups "can make some spectacularly interesting cocktails as a straight syrup, they produce curious G&Ts. Great for their odd, homemade quirkiness but maybe not for everyone." This recipe is pretty similar to Jeffrey Morgenthaler's above, but ditches the citrus juice, adds lavender and cardamom, and ups the amount of the citrus zest. (And instead of an orange's zest, it substitutes a Seville orange's, or a grapefruit's or a pomelo's. I used grapefruit.) 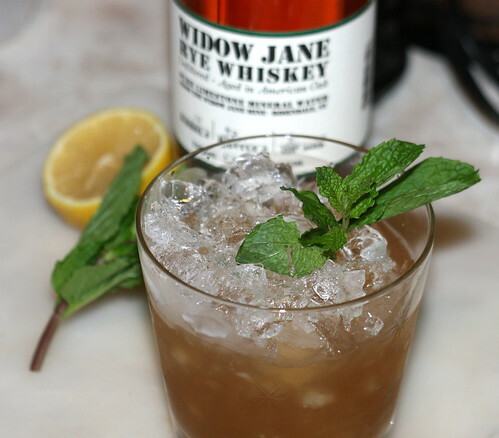 This mix is sweetened with rich simple syrup, and similar to the other recipe I added a small amount of vodka to the finished syrup to prevent mold and spoilage. 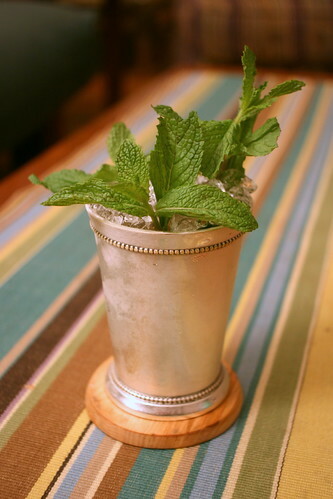 Tomr's Tonic: Made by New York bartender Tom Richter, whom I encountered at the Beagle in the East Village. His friendliness and enthusiasm put his tonic syrup on my radar. His syrup, which he describes as combining the best aspects of several different readily available recipes, is sweetened by organic cane sugar. The Results: Well, you're just going to have to wait for the next installment. Isn't this one long enough?